Have you ever felt intimidated by not having “enough faith”? Have you ever been around someone who is the poster kid of faith and feel like you are faithless? There is something major in your life that is happening and you are expected something good to come out of it, but the opposite happens; have you ever settled for such circumstances to be “the end”?Have you ever questioned if God is even listening to you, or if He is even real? If you said yes to the following questions, you are not alone. For many of us, we have developed a notion that tells us that little faith means no faith. Which is why so many people lose faith completely because they try to compare the little faith they have to their big mountain of a problem. We all have fallen victims to this misconception. 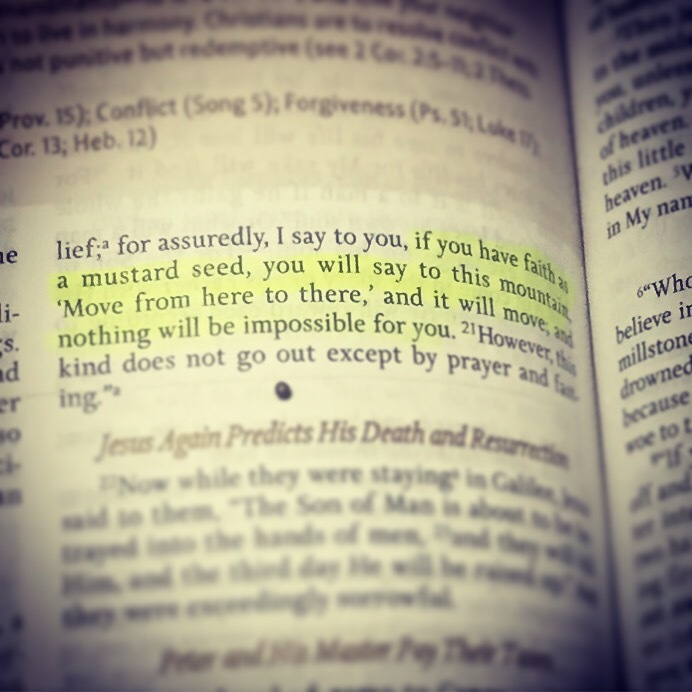 Jesus mentions in Matthew 17:10 that if only we have the faith as a mustard seed, we could move mountains. Out of all the seeds in the world, Jesus decided to choose the mustard seed, the tiniest seed, to show us how much faith we need. This, right here, is MIND BLOWING!!!!! Now to stir up the pot a little bit more, let’s see how faith is defined in Hebrews 11:1, “Faith is the confidence that what we hope for will actually happen; it gives us assurance about things we cannot see. (NLT)” In other words, faith is simply believing without seeing. Just a little hope and assurance that things will work out for the better is all that we need. Think back about the story of Jairus, after he received word about the death of his daughter. He was heart broken, but Jesus said to him, “Have faith.” Imagine how much faith Jairus had to begin with and after he received the bad news. The little faith that Jairus could muster up in Jesus had brought his daughter back to life. He didn’t relinquish any ounce of faith. What I have noticed about those who have claimed that they had lost their faith in God is that they were investing their faith in other things besides the Sower of our faith. The more we invest our faith in worldly materials, man’s approval, and even ourselves, the less our faith in God decreases. I was once told during my darkest time that if it wasn’t for the little faith I had, I would have been marked off as suicidal. My fun-size faith in a King-size God has saved my life!! What are some mountains are you willing to move today? What’s stopping you from moving your mountains?